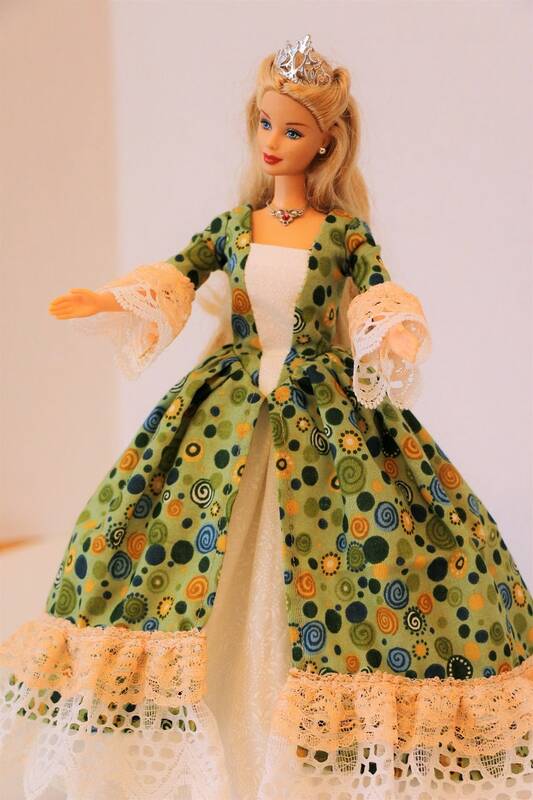 This Barbie dress set comes with a green overskirt covered in geometric swirls and dots overskirt and an underskirt made for 11 1/2" dolls, like Barbie dolls, and have velcro closures. - A green overskirt covered with geometric swirls and dots in green, blue, gold, and black. There is a double lace ruffle of white and peach on the hem of the overskirt. The white inset matches the underskirt. The same underskirt lace is on the sleeve edges. - A white underskirt with white vines and leaves lined with tulle.